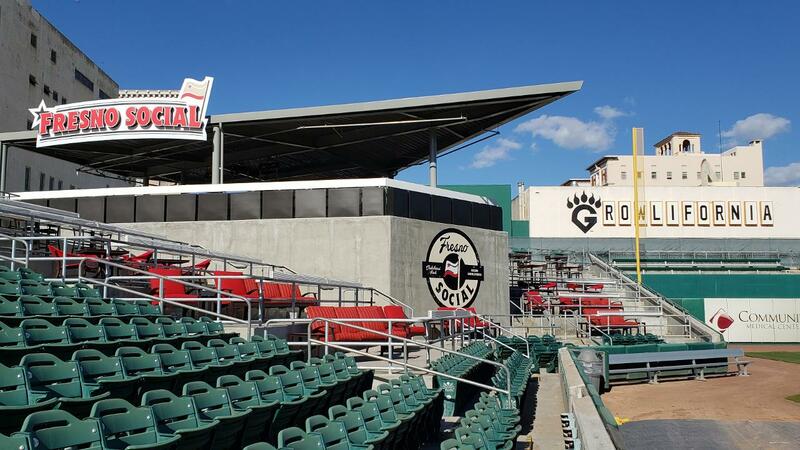 The $3.4 million dollars in capital improvements pledged to Chukchansi Park by the Fresno Sports & Events LLC ownership group, now in their second season operating the Fresno Grizzlies, are taking shape in advance of Opening Day 2019 (Thursday, April 4, 7:05 p.m. first pitch). The 18-year-old home of the Triple-A club in Downtown Fresno will have a distinctly more modern feel with a remodeled club level, a new left field social gathering space/bar, and a state-of-the art kids "splash zone" in right field. Individual seating capacity in the stadium has been reduced from 12,500 to roughly 10,500; a necessary subtraction in order to make the overall ballpark experience markedly better for fans from end-to-end. With tickets still beginning as low as $10, the Grizzlies have been able to strike the unique balance of offering a better experience without passing that cost along to fans. FRESNO SOCIAL: The days of fans sitting in a single seat for a three-hour baseball game are over. "Fresno Social" will totally change the way people take in an evening at Chukchansi Park. A premium area without premium pricing, the walk-up and sit-down bar and lounge area complete with furniture and drink rails is open to any fan at any time. Complete with a great view of the playing surface from the left field/third base side of the ballpark, fans socializing won't miss a minute of the action, with six 55-inch HDTVs overhead. Get up, move around the ballpark, and enjoy the game from new angles like never before. SPLASH PARK PRESENTED BY COMMUNITY MEDICAL CENTERS: The 1,500 square foot water park in right field will provide a respite from summer temperatures all season long, keeping kids and parents alike plenty entertained and cooled off. The Splash Park presented by Community Medical Centers is also at no extra charge to Grizzlies fans, open to all fans during any home game. THE KODIAK CLUB PRESENTED BY KY FARMING: After undergoing an extensive renovation, it's the first significant upgrade on the second level of Chukchansi Park since it opened in 2002. The new function room includes: A brand new walk-up bar, new tables, chairs and barstools, renovated restrooms, new flooring, several new flat screen TVs and a new all-you-can-eat buffet for each game, with kid-friendly dessert and snack stations, to replace the catered portions of past iterations of "The Club." The premium area encompasses the stadium's main large function room overlooking the first base side of the field (also open to fans holding suite tickets), and the "600 Level" seating accessible only by seasonal Club membership or single-game Club tickets. FOR THE FOODIES: $200,000 of the $3.4 million in capital projects went to improve concession areas and food quality, in conjunction with on-site caterer and concessions manager Professional Sports Catering. Not only will wait time and line length continue to decrease, but "Uncle Bear B-Q" is a brand new smoked BBQ concept, beginning on opening day, located on the third base side of Chukchansi Park. GRIZZ WIN: The manual scoreboard in right-center field has received a facelift as well, thanks to the support of Gar Tootelian. FAN SAFETY: Netting to protect against line-drive foul balls along each dugout, first installed for the 2018 season, has been raised for greater protection for fans sitting in the lower bowl in the several rows along each base line. In addition to the new fan amenities throughout Chukchansi Park, guests will notice additional upgrades on the main concourse level as well. All women's restrooms on the main seating/street level have been thoroughly renovated, with new flooring, lighting and new fixtures. Fans will also notice several large monitors and electronic kiosks throughout the ballpark courtesy of ISM Connect, a new-for-2019 partner of Minor League Baseball. The screens will display upcoming promotional information, ticket offers and other ballpark information as it relates to the improved fan experience. "We're on the verge of the most exciting opening day in franchise history, and I really mean that," said Team President Derek Franks. "It's not easy to get the feel that everything is new when a franchise is entering its 22nd season, but with the money and sweat we've put into the ballpark during this offseason, and launching our new uniquely 'Growlifornia' brand, it truly is a new era. I think our guests will agree that Chukchansi Park and this ballclub is something for Fresno and the entire Central Valley to be proud of." The current lease at Chukchansi Park with Fresno Sports & Events LLC runs through the 2036 season, making the long-term atmosphere and fan experience during Fresno Grizzlies games priority number one.